Freedom Rockz: Free Curly Fries @ Arby's! Happy Pirate Day! Free Curly Fries @ Arby's! Happy Pirate Day! 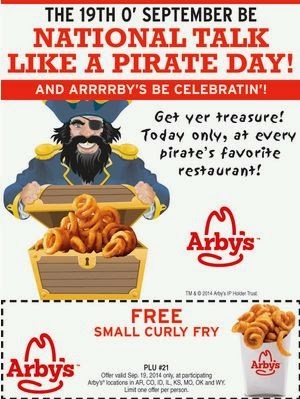 If you are a member of Arby's email deals you will get your treasure today only -a coupon for free curly fries today in honor of Pirate Day! Happy Pirate Day! Click the link below to go to Arby's website & if you are not a member sign up.